Looking for Inclusion Athletes, Pushers and Volunteers!! We are always looking for more people to be involved. Sign up today and join in the fun! Are you looking for a new jewelry piece? Consider buying from Embrace the Difference and part of the profits go to us. RACIN! is here to provide recreational opportunities to those in our community that need them. Thank you for visiting RACIN! We appreciate your interest in our organization. Here’s a little about us: First, our name stands for the Rollin’ Athletic Club Inclusion Network. 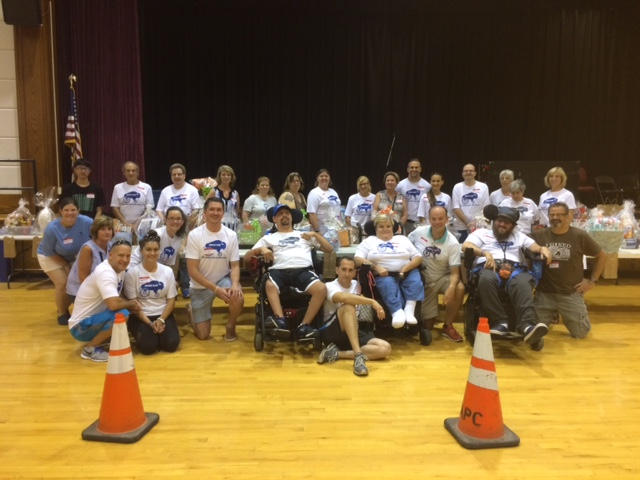 We’re a dedicated group of like-minded volunteers that collectively recognized that there was little to no participation from people with developmental disabilities in the Western New York racing community. Together, we saw an opportunity to include these energetic and spirited folks in races of all distances. With that mission in mind, RACIN! was formed in 2013. We bring the community together to advocate for greater opportunities for people with developmental disabilities to wholly participate in road races. As we continue our journey, we’re always looking for additional help. Find out how you can help as a volunteer, donor or in another capacity. The mission of the Rollin’ Athletic Club Inclusion Network (“RACIN!”) is to improve the physical, social and emotional lives of people with developmental disabilities through regular physical activity and involvement in the local racing scene. Together, we run, walk and roll!